Miami, Florida: What to Do, See and Eat! Miami, Florida is a popular destination for those looking to relax and hang out on the beach or enjoy the vibrant nightlife. 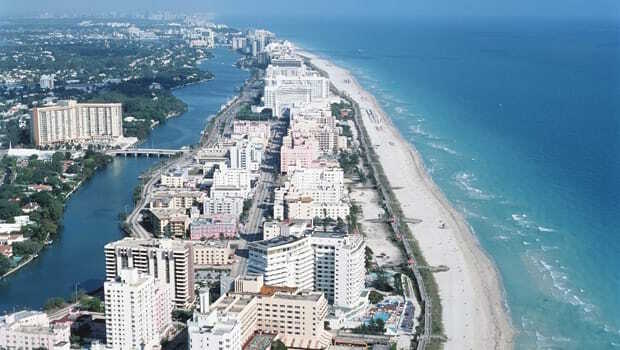 South Beach is the world-renowned destination for those wanting to tan or surf. Visit exotic animals at Jungle Island, discover rare artworks at the Bass Museum of Art or dance the night away at Mynt. There are also many opportunities to go deep sea fishing, snorkeling, sailing and kayaking. Here is some basic information you'll need to know if you're visiting Miami. Be sure to check out our "10 Things to Do Under $10 in Miami" blog as well. If youjust reached the city, chances are you landed in Miami International Airport located in Miami-Dade County. As you walk through the airport, you will see artwork sponsored by the Division of Fine Arts & Cultural Affairs to showcase Miami's culture and community. Exhibitions include "Experience the Everglades," "Aviation in Miami" and "The Roaring Twenties and Thirties in Miami Beach." If you have some extra time to spare, you can visit the 200+ shops and restaurants in the airport. If you are looking to stay at a nearby hotel for the first few days, you can stay at the Miami International Airport Hotel, dubbed as the only hotel located inside in the airport. If you are headed to a specific destination once you land, there are several shuttle options available to you. Taxicabs and SuperShuttle vans are available on the ground level of the airport, and hotel and car rental shuttles are on the upper departure level. You can view this chart to get the best rate based on where you are going. Major car rental carriers can all be found in the baggage claim area of the airport. The new MIA Rental Car Center (RCC) is one-mile east of the airport and provides services from 16 car rental companies of 6,500 vehicles. You can take the MIA Mover electric-powered train from the airport to the RCC. You may also want to check out our blog, "How to Rent a Car in the USA" for helpful tips. The Metrobus is one of the easiest ways to get around Miami. There are more than 95 Metrobus routes traveled on a daily basis. They can easily take you to the major shopping and cultural centers, as well as hospitals and schools. Some routes operate 24/7 so be sure to check the bus schedule if you are planning to commute late at night. The fee per trip is $2.00 and purchasing an EASY Card or EASY Ticket is always recommended for free bus-to-bus transfers. The Metrorail offers a convenient system for those who need to get to far destinations within Miami. There are 23 accessible stations located about one mile apart, though very close to bus stops. It operates from 5 a.m. to midnight, 7 days a week. There is an Orange Line and Green Line: the Orange Line includes additional service to and from the Miami International Airport. The cost per trip is $2.00 and the purchase of an EASY Card or EASY Ticket is needed to ride the Metrorail. The Metromover is another train service provided for Miami commuters, and it is free of charge. It connects with the Metrorail and Metrobus at certain locations throughout the downtown area. The major destinations on the Metromover route include major destinations within Omni and Bricknell (which run from 5 a.m. to midnight, 7 days a week), and other locations such as the School Board, Freedom Tower, Government Center and Financial District. If you know how to ride a bike and would like to tour the beach areas of Miami, you can visit a Decobike location near you. It is a 24-hour bike-share program that allows you to rent at hourly or membership rates. Participating in the bike share allows you to ride anywhere in the area and dock at any Decostation location, so you can check another bike during your rental period. Before renting a bike, be sure to read our blog about Bike Safety. Miami is located just above the tropic of Cancer and is very close to the Gulf Stream, which largely influences Miami's unique climate. The city is known to have a tropical monsoon climate, and it is generally warm all year round. The coldest months of December – February average at about 68 degrees F and the summer months of June – September average at about 82 degrees F. The other months average at about 75 degrees F. January is the coldest month of the year and August is the hottest. Due to the warmer climate, Miami is known as one of the most common places for Americans to retire. Miami receives approximately 60 inches of rain annually, with the wettest months being June, August and September and the driest months being December, January and February. Thunderstorms are also frequent at almost eighty days out of the year. Hurricanes are also very common, mainly because the ocean and low-lying coastal plains around Miami. Vizcaya Museum and Gardens – Vizcaya was first built in the 1910s by James Deering, owner of the Deering Harvesting Company, who suffered from anemia. The doctors prescribed abundant sunshine and a warm climate to help him recover. Therefore, Vizcaya became his ideal vacation home. The structure of the home was deeply influenced by his love for sailing, landscaping and plant conservation. It was named after the Spanish merchant Vizcaino who explored the Americas in the 1600s. Today, the museum showcases the Main House with 34 decorated rooms filled with more than 2,500 art pieces. The gardens present a vast orchid collection and 25 acres of forestry. You can visit the gardens every day except Tuesdays, Thanksgiving and Christmas Day from 9:30 a.m. to 4:30 p.m. Adults: $15, Students with ID: $10. The Biltmore Hotel – Believe it or not, this hotel located in Coral Gabels is known as a national historic landmark. First built in 1926 by John McEntee and Bowman Merrick and designed by Schultze and Weaver as part of the Biltmore hotel chain, it functioned as a hospital during World War II, Veterans Health Administration Hospital, and campus of the University of Miami medical school until 1968. It was once dubbed as the tallest building in Florida, and its pool was once the largest pool in the world. Today, it is a luxury resort that hosts weddings, offers spa services and hosts a culinary academy. Freedom Tower – In 1925, the Freedom Tower was designed by Schultze and Weaver, the same architects that designed the Biltmore Hotel. It is located on the Wolfson Campus of Miami Dade College and first served as the printing facility for the city's newspaper, The Miami News. Later, in the 1960s-1970s, it was operated by the federal government to process, document and provide health services to Cubans who arrived in Miami to escape the rule of Fidel Castro. Today, it is a cultural and educational center, housing famous artwork by Dali and Da Vinci. The Miami Circle- The Miami Circle at Brickell Point is now an archaeological site that preserved cultural symbols of one of the first Native North American groups encountered by Juan Ponce de Leon in 1513, the Tequesta. The Miami Circle feature is a 38-ft circular footprint of a structure that likely once stood centuries ago. Zoological Wildlife Foundation - If you love animals, visit the Zoological Wildlife Foundation where you can take a private tour and interact hands-on with some of the animals, including Capuchin Monkeys, Toco Toucan, Gibbon Apes and more. If you pay extra, you can even have a photo session with a tiger cub, clouded leopard, black jaguar, or primate! Private tours are conducted 11:00 a.m. – 7:00 p.m. everyday. Be sure to call and make an appointment in advance. South Beach - South Beach is a popular destination for beach lovers who enjoy basking in the sun, tanning on the sand, and surfing the waves. You can swim, build sandcastles, play beach volleyball, and more! Art Deco architecture adorns the 1.6-mile beach path used for rollerblading, walking and biking. There are festivals, four theatres, and free movie nights throughout the year on the North Shore Park Bandshell. Don't forget about all the shops, spas, golf courses, and museums you can visit! Millionaire's Row – Millionaire's Row, also known as Millionaire's Mile or Alpha Street, refers to the 21-block property on the waterfront between North Beach and South Beach, filled with luxurious homes of the rich and the famous. Many politicians, movie stars, famous athletes and business moguls reside on the Row. If you wish to see the homes of any famous names such as Al Capone or Shaquille O'Neal, you can take a boat tour on the Biscayne Bay Sightseeing Cruise. - Everglades Safari Park – Visit the popular attraction, Everglades Safari Park, and take a Tour that consists of a 30-minute Airboat ride through the Everglades National Park, the Alligator Wildlife Nature Show, Jungle Trail, Observation Platform and Exhibits. The cost is only $20 if you book online. Aside from the beach, Miami is notable for its exciting nightlife. Popular celebrities visit clubs and lounges throughout Miami to perform and party. Some famous names include Ricky Martin, Britney Spears, Colin Farrell, who enjoy Mynt Lounge, located on 1921 Collins Avenue. Some have acclaimed it as the "best club in South Beach," where the house music gets everyone dancing until 5am. Nikki Beach Club is an outdoor beach club, which provides VIP bottle service and lounge beds situated right by the water. Mansion is known for its art deco theatre with plenty of dance floors, rooms, and bars to move around to throughout the night. Be sure to check the schedule to attend live concerts featuring up-and-coming DJs and artists. If you are looking for more adventurous activities to do during your stay in Miami, there are many places where you can sail, fish, and snorkel. Shake-A-Leg Miami in Coconut Grove offers a relatively cheap rate for private sailing lessons, with $45 per hour for 2-4 students. If you would like to go fishing for a half or full day, there are many drift fishing party boats such ones offered by Reward Fleet, which average at about $50 for 4 hours. For the other half of the day, you can opt to go snorkeling with South Beach Divers. The cost is $65 per person, which includes rental gear and 4 hours of snorkeling. Arnold's Royal Castle – This restaurant is known for their mini cheeseburgers, which are comparable to White Castle, but better! You are likely to run into Arnold's Royal Castle on the I-95 road, so if you're hungry after a long drive, be sure to stop by and have a few burgers. News Café South Beach – This establishment on Ocean Drive serves as a cafe, newsstand, bar and restaurant. It is open 24 hours a day, 7 days a week and features 2-for-1 drinks Happy Hour special. We have heard that their breakfast options are some of the best in town. Andiamo – Everyone in Miami raves about Andiamo's pizza. The Andiamo signature pizza is made with tomato sauce, mozzarella, and basil for $8.95 a pie. If you want to be more adventurous, you can try the New Haven Clam Pizza, which is made with fresh garlic, mozzarella, clams, capers, red pepper flakes, and oregano. Anything you try here will be a hit! Puerto Sagua Restaurant – It would be a shame to leave Miami without trying Cuban food. Stop by Puerto Sagua and have the classic Cuban sandwich or the very popular oxtail soup. Sushi Chef- This Japanese restaurant presents quite an extensive menu, with sections such as "Original Exotic Menu," and "Vegetarian Sushi Menu" and "Sashimi Combo Menu" which includes dishes such as Scallop Sauté, Lobster Tail or Shrimp Tempura, and Kamameshi, which is a Japanese style Paella. Graziano's Restaurant - Graziano's has been serving the best steak to Miami residents for two decades. We also hear that their empanadas are a must-try. Featured wines on their special list are 50% off all day Mondays and Thursdays. Michy's - Michy's is the go-to American restaurant for most who first arrive in Miami. You will find a great variety of dishes from Goat Cheese Gnocchi with Lamb Meatballs to Korean Friend Sweetbreads. Trattoria Luna - Expect to have lots of pasta and meat dishes to choose from at Trattoria Luna! We recommend the lasagna or Salmone "Alla Genovese." Don't forget to try the pumpkin ravioli and panna cotta with strawberries. Jamon Iberico Pata Negra Restaurant Tapas & Wine Bar - This restaurant on 10 SW S River Drive has been raved as one of the most authentic and delicious Spanish restaurants in Miami. The location is a bit inconvenient, as some have noted that it is easy to miss, but it is well worth the search. Try the Rice in Squid Ink or Croquettes.